Fresh water is a vital resource for life on this planet. Alarmingly, it is evident that it is becoming a scarce resource in many areas of the world. Taking the needs of addressing water impacts to a new level, H&M and WWF have teamed up to implement a new, cutting edge water strategy. It is a plan that takes the whole value chain into account, in aim to make change in the fashion industry. This partnership with WWF marks a big milestone for H&M. It is ambitious, and in line with our vision for sustainability, to run in a way that is economically, socially and environmentally responsible, we see this milestone as an utmost necessary way to move forward. “Water is a key resource for H&M and we are committed to ensure water is used responsibly throughout our value chain. We do this to minimize risks in our operations, protect the environment and secure availability of water for present and future generations. Karl-Johan Persson, CEO of H&M. 5. influencing governments on water policy. This work aims to cover all aspects of what H&M can influence, starting already at the designers drawing board. To work with such a wide spectrum of influence is ambitious, but we’re not starting from scratch. 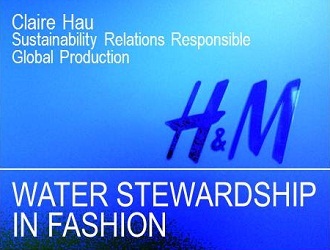 In fact, H&M has been working on reducing negative water impact in our value chain for more than a decade. The first milestone of our work on water dates back to 1995, when H&M published its first Restricted Substances List (RSL). The RSL specifies the ban of chemicals which are considered hazardous and sets limit values on the finished product to ensure the safety of our customers, as well as workers in the factories and the environment. Whilst the focus is on preventing, reducing the use of hazard chemicals and limiting amount of chemicals in the finished product; working with the RSL has trickled tremendous effects on the design of manufacturing processes, which has had significant effects on water sustainability. The way in which we use chemicals changed, and this affects the amount of chemicals that can sub sequentially be discharged into waterways. Of course, small residuals of hazardous chemicals can still exist and discharged into waterways, which is why we have made a bold commitment to lead the industry towards Zero Discharge of Hazardous Chemicals (ZDHC) by 2020. We acknowledge that there’s a lot to do, and we must work collaboratively, together with the industry in order to make systemic change. When H&M’s Code of Conduct was launched in 1997, we started to demand compliance with environmental requirements from our suppliers. In 2003, we included the monitoring of waste water treatment in our audit work and placed stricter timelines for non-compliant suppliers to implement proper treatment. These requirements were later upgraded with the BSR’s water quality standard and all our direct suppliers and sub-contractors including washing and printing units have since been required to comply with this standard or the local law, whichever is the strictest. Pushing our work on wastewater discharge further, H&M has been working closely with the Institute of Public and Environmental Affairs in China who publishes environmental data of suppliers who have been reported with discharge violations. H&M requests for suppliers who have been reported to provide feedback to the IPE and work on corrective action. At the beginning of our value chain, we have been working actively with making cotton production more sustainable. Cotton is a very important material for H&M, but conventional ways for cotton production places heavy impacts on the environment. The first time we used organic cotton was in 1995 and today H&M is the world’s biggest user of organic cotton. In 2005, H&M was one of the founding members of Better Cotton Initiative (BCI). BCI is a multi-stakeholder program working to educate farmers to grow cotton more sustainably, by using less water, pesticides and fertilizers, as well as support childrens’ right to education. Last year H&M sold our first products with BCI cotton. By 2020, H&M’s goal is to use cotton only from sustainable sources namely BCI, organic and recycled cotton. A more direct water initiative can be illustrated through our denim water saving program. In 2010 we started off with an ambitious target to save 50 million liters of water through the implementation of better water management and water saving technologies, enabling better water efficiency in the denim washing processes. Gradually we spread these practices to more suppliers and applied to more styles which in 2012 have resulted in an estimated annual reduction in water use of 450 million liters- that’s 180 Olympic size pools worth of water! The figure is indicative of the impact these measures can have on reducing the water footprint in supply chain and highlights the importance of making this standard practice in the industry. “This partnership marks an evolution in the corporate approach to water. 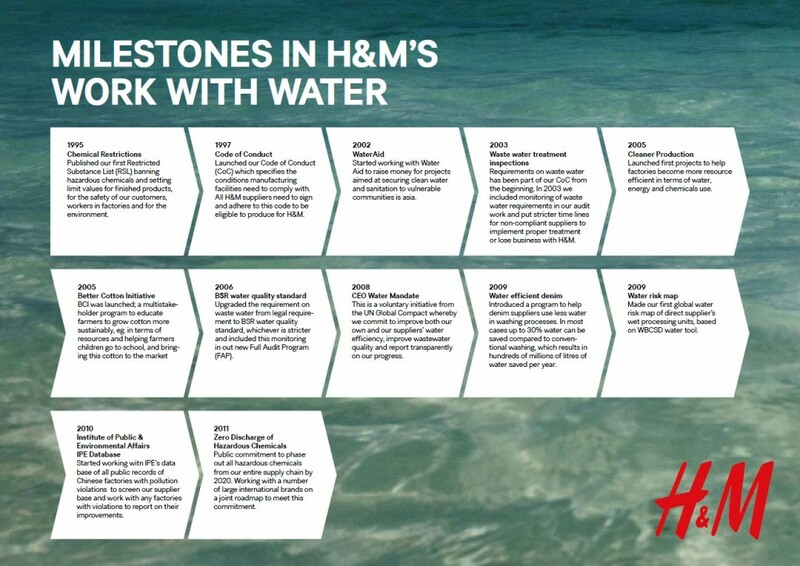 H&M understands that its long-term success depends on access to adequate water supplies. It also understands that its social license to operate depends on being a good neighbour and good steward of shared resources. Proactively, H&M has also created water risk profiles, using WWF’s Water Risk Filter to understand the level of water scarcity where wet processing factories are located- a part of the comprehensive evaluation we made at the beginning to form the basis of a new holistic water strategy for H&M. Drawing on knowledge and experiences gained from more than a decade of work, H&M saw the need to build on these efforts and set a holistic water strategy to be able to address the water risks we face. WWF had been a speaking partner for H&M during a number of years and therefore it was natural to initiate a formal collaboration during 2011 to assess all water-related aspects of the H&M value chain. Moving boldly forward, we have now entered a three year partnership with WWF to implement this strategy with the aim of setting new standards for water stewardship in the fashion industry. United in a common vision for availability and quality of freshwater for people and nature, H&M and WWF will address water impacts and risk in the H&M value chain and key river basins– aiming to inspire and lead change within the textile and fashion industry as well as educating consumers about water issues. To make a positive contribution to solving water challenges, companies need to look beyond their own footprint and engage with each other as well as stakeholders on how water is managed. Only then can water risks be sufficiently addressed. Claire is working as the Sustainability Relations Responsible, Global Production for H&M. In this role, she is working mainly with relations, communication, training and education for sustainability in production globally. Claire started off her career at H&M with a strong focus on environmental issues; namely on water in China and Bangladesh- to understand the situation and support pragmatic ways for improvement across the supply chain. More recently, she has been working with Chemicals, where she has been heavily involved in supporting H&M in realizing its commitment ‘Towards Zero Discharge of Hazardous Chemicals by 2020’. Prior to joining H&M, Claire studied fashion design in the UK. During her studies, she developed a deep passion for sustainability, where she felt that there has to be a better way to make change, starting from the drawing board. She later obtained a Master in Global Fashion Supply Chain Management in Hong Kong, and exchanged abroad in France and USA.